*** Update 3/8/17 The coast path is open again. Please keep to the path and away from the cliff edge. *** I’ve not seen it myself but the rock fall on East Beach last week, triggered by heavy rainfall, was a substantial one. Part of the coastal path by the golf course was taken away. The mound of rocks on the beach reaches quite a distance from the base of the cliff. Luckily it happened overnight and nobody was hurt. It does bring it home that you always need to be very careful and not go too near the edge of the cliff on Jurassic coastal path walks, or the base of the cliffs on the beaches too. Currently the cliff path remains closed and the base of the cliffs around the rock fall have been cordoned off with safety warnings in place. Please don’t go too near to have a look. 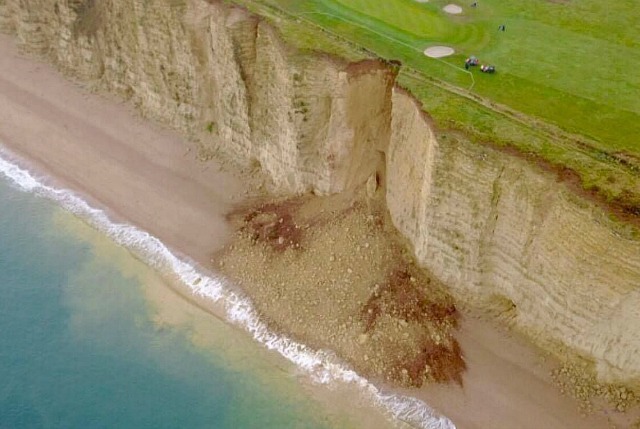 Here is the BBC report on the rock fall.